“Avgolemono” is a traditional Greek chicken rice soup but in short we always refer to it as “Avgolemono”. A whole chicken is usually boiled to accompany the soup but also to take the broth and cook the rice in it. It is then thickened to a creamy consistency by the addition of avgolemono sauce (literally meaning egg (avgo) and lemon (lemoni). 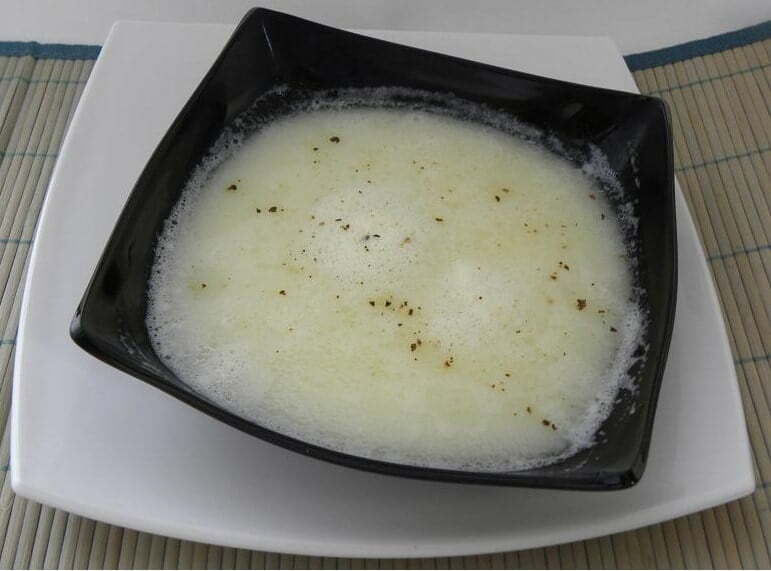 When the avgolemono is added, the soup thickens after a while because of the animal fat contained in the dish (chicken broth). However, if you are cooking something lean i.e. chicken without the skin on, fish, turkey or chicken mince, if you want the sauce to thicken you must add a couple tablespoons of olive oil while cooking. Today it was a rather cold day here in Athens 2 – 8o C (35 – 46 F), so it was a good opportunity to make some soup. As avgolemono always starts with a chicken broth, I boiled chicken to make the soup (see tip How to… clean and boil a chicken). Clean and wash chicken. Put it in a pot and add enough water to cover it. When it starts to boil, remove any froth with a slit spoon and continue till the water is clean. Add salt, reduce heat and cook until the chicken is very tender, about half an hour. Remove chicken, add rice and cook for 20 minutes. Serve hot with freshly grated black pepper. I giggle when Greeks lament of cold weather! However, the Avgolemeno was made for days like these and it’s always best (as you did) made with real chicken stock (koto zoumo). I told my family today that I wrote about the cold and I told them that when they see it in Canada and Alaska they will be laughing at me, but still for us it is cold.